What a month! 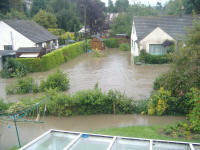 July 2007 has been one of the wettest since records began and Dursley saw its fair share although nowhere near that of the scale seen further north in Tewkesbury and Gloucester. Some flooding did occur along Yellow Hundred, Ewelme Close and part of the new development on the old Bymacks site and water entered a few of the houses. The rain began in earnest on Friday 20th July and lasted for much of the following few days causing local rivers and stream to rise quickly and burst their banks. The Dursley Town Festival took place over the week of 7th-14th July and fortunately the parade on the final day enjoyed a day of good weather with large crowds coming to watch the spectacle. Work is now being carried out on the old swimming pool in Water Street which suffered a fire in January 2006. The roof has been taken off and progress seems to be being made on refurbishing the old building. 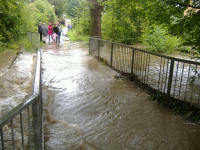 On the evening of 20th July the rain fell heavily and the Ewelme soon burst its banks and actually came over the bridge along the footpath and flooded the surrounding area. Standing on its own island in the Yellow Hundred area of town, this house looks out upon a flooded garden although fortunately the water didn't go inside. Morris dancers put on a display in Dursley town centre on a warm Saturday morning during the town festival. BBC Radio Gloucestershire were in attendance to report on events. Crowds gather in Water Street as the various groups line up ready for the start of the procession through the town centre for the final day of the Festival. After a year and a half some attention is now being given to the old swimming pool in Water Street which suffered a serious fire in January 2006.